The image above shows the Serena adjustable bed. The mechanism has the head and foot ends slightly raised. Option one of build an adjustable bed online http://www.bed-adjustable.co.uk/products/index.html asks if you require single or twin beds. The adjustable bed in this photograph is shown in the very popular Ivory suedette. There is a basic choice of four colours however, should you have a customer with specific ideas on colour and material we can manufacture the base to individual requirements. There would be an additional charge. The images do not specify which adjustable bed mattress has been selected but we have additional photographs that show the construction of each of the five mattresses in our range. As you can see, no headboard has been selected for this adjustable bed although there is a range of eight headboards to choose from. 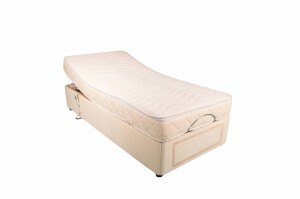 Again this image is of the Serena with the adjustable bed mechanism in the slightly raised position. The 3′ single is featured in ivory. It is worth mentioning that although ivory is a light colour and could show any marks. The suedette fabric used to make the adjustable bed base is pretreated to make the material washable. The most popular adjustable bed mattress is the high quality memory foam mattress which flexes well when the mechanism is profiled but you can select from our range of five different types, all specifically designed for use on adjustable beds. Again no headboard has been selected for this bed. Headboards are not as necessary on an adjustable bed as they are with a conventional divan bed. The reason is that when you raise the adjustable mechanism into a sitting position, you are leaning against the mattress instead of the headboard. This entry was posted on Saturday, October 8th, 2011 at 1:46 pm	and is filed under Adjustable Beds Trade Pages. You can follow any responses to this entry through the RSS 2.0 feed. You can leave a response, or trackback from your own site.